Holy one night only Batman! This is your chance to see some of the Caped Cusader’s greatest foes teaming up in the most epic adventure ever. 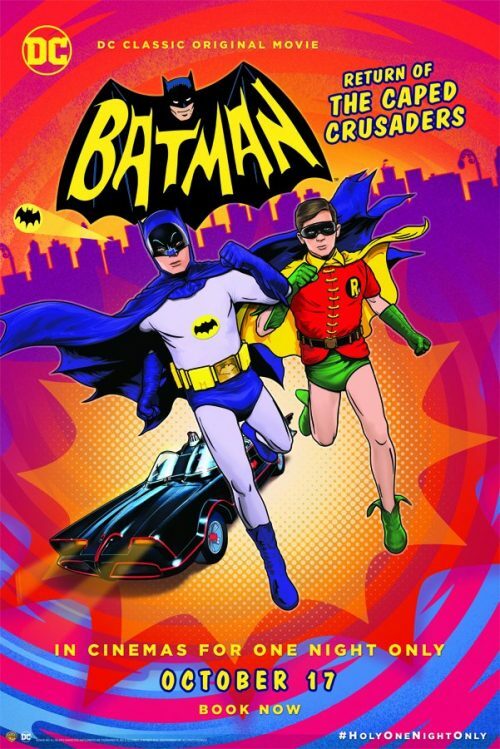 Not only that we have Adam West, Burt Ward and the great Julie Newmar reprise their greatest super-hero roles in this animated adventure. It’s back to the 1960s as Batman and Robin spring into action when Gotham City is threatened by Batman’s most-evil opponents – The Penguin, The Joker, Riddler and Catwoman. The four Super-Villains have combined their wicked talents to hatch a plot so nefarious that the Dynamic Duo will need to go to outer space (and back) to foil their arch enemies and restore order in Gotham City. Batman: Return of the Caped Crusaders pays homage to the original Batman series, reuniting Adam West, Burt Ward and Julie Newmar as they reprise their roles as Batman, Robin and Catwoman.